Makita U.S.A. Inc., announces two new tools for efficient metal cutting. The 18V LXT Cordless Compact Band Saw (XBP03) and 18V LXT Cordless Brushless Threaded Rod Cutter (XCS03) allow users to cut overhead. The 18V LXT Cordless Portable Band Saw (XBP03) features a Makita-built high torque motor with 630 ft/min. blade speed for faster cutting. The 2-1/2-in. cutting capacity is ideal for cutting conduit, Unistrut, all thread, channel, corrugated, pipe, sheet metal, square tubing, and more. The adjustable foot protects material and provides positive support for more accurate cuts. The XBP03T is engineered for a range of metal-cutting tasks, including electrical, HVAC, installation, metal building, metal fabrication, and plumbing. Other features include a wheel cover that encloses the blade outside the cutting area, making the saw suitable for one-handed operation (per ANSI Standard 60745-2-20), and the adjustable blade position which allows for accurate blade tracking for improved blade rotation performance. The 18V LXT Cordless Portable Band Saw is available as a bare tool (XBP03Z) or kit (XBP03T) option. Ideal for overhead cutting of installed threaded rod, the 18V LXT Brushless Cordless Threaded Rod Cutter (XCS03Z) provides spark-free cutting for clean, burr-free cuts and easy threading. The XCS03Z cuts installed threaded rod ¼ in. and 3/8 in. in diameter. It will make up to 1,333 cuts of 3/8-in. threaded rod and 1,250 cuts of 3/8-in. stainless steel threaded rod with a 5.0Ah battery (sold separately). The ergonomically designed handle enables users to keep their wrist at a straight position while operating for increased comfort. An integrated two-position rod guide helps stabilize material for precise cuts. A reverse feature releases jammed material by reversing the rotation of the motor. An automatic blade stop mechanism returns the blade to an open position once cut is complete to continue operation. The XCS03Z also includes reversible double-edged cutting dies for twice the life of the blade. These metalworking tools are part of Makita’s expanding 18V LXT system. With over 200 solutions, LXT is the world’s largest cordless tool system powered by 18V lithium-ion slide-style batteries. Makita 18V batteries have the fastest charge times in their categories, so they spend more time working and less time sitting on the charger. Both the XBP03 and XCS03 include Makita’s exclusive STAR Protection Computer Controls, which provides additional protection during the most demanding industrial applications. STAR Protection is communication technology that monitors conditions during use, allowing the tool and battery to exchange real-time data to protect against overloading, over-discharging and overheating. If STAR detects conditions that threaten the tool or battery, the tool will automatically stop. At that time the user can restart the tool, change the battery or charge the battery. Then put the tool back to work! 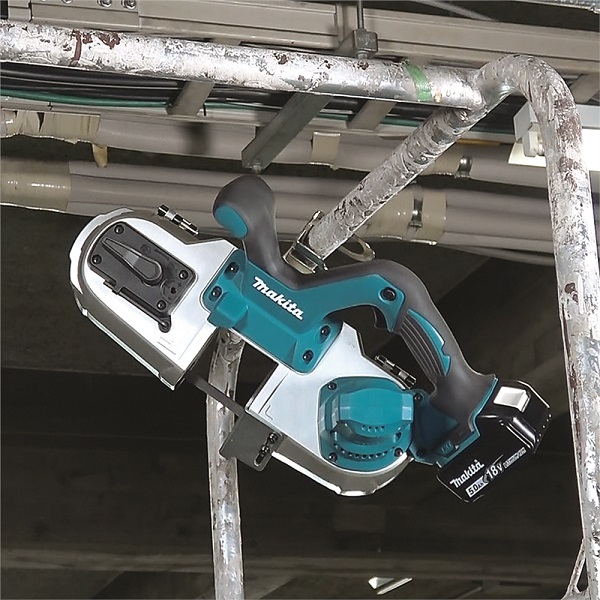 The battery tool can be powered by Makita 18V LXT and Compact Lithium-Ion batteries for added versatility, as long as the battery features the STAR symbol indicating STAR Protection inside. Click here for more Makita news!